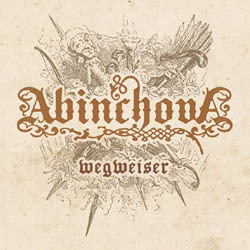 Swiss folk death metallers Abinchova from Lucerne will release their second full-length album “Wegweiser” on July 5th 2014. The band was formed in 2005 but became active in 2009, when they also released their first EP. Their debut album “Versteckte Pfade” was out in 2011, followed by the 3-track 7″ EP “Handgeschrieben” in 2012. The new album “Wegweiser” is a crowd-funding project that will be self-released in a beautiful digipak edition CD, including booklet. As always, the design has been created by the band itself. The cover artwork and album tracklist have already been unveiled and the band will soon reveal the first sound samples and info on CD pre-order.